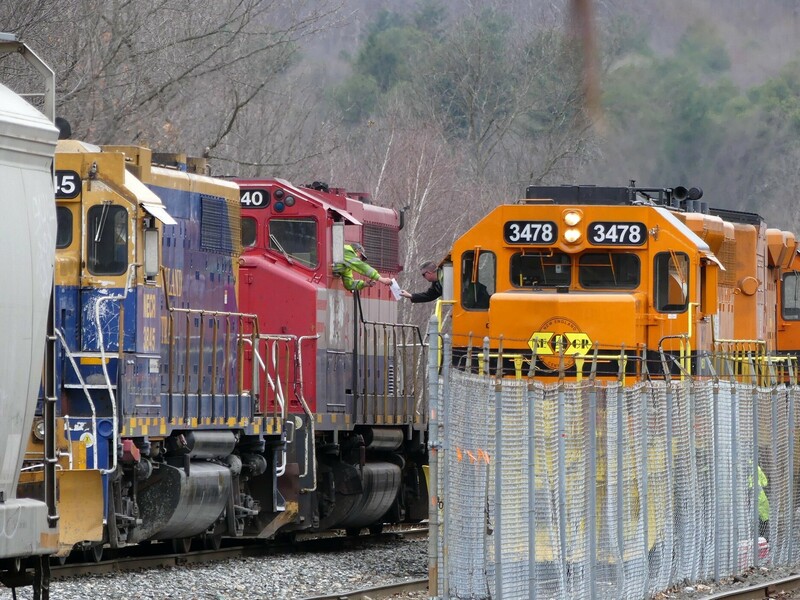 On the left is power for NECR Palmer local 603 which has just pulled the cut of cars headed by the covered hopper on the far left out of the yard south of the CSX diamond. Power on the right is a trio of SD40 rebuilds that had been waiting with the inbound 611 consist from Brattleboro. The unfortunately placed hurricane fence likely belongs to Mass Central whose small engine facility is out of sight to the right. 611 power has cutaway and will couple onto the covered hopper while 603's engines will grab the inbound consist (including many loaded Amtrak ballast cars) for which it has received paper (wheel report and/or air slips?) and drag it to the yard for parsing. In a few minutes once the Palmer main is cleared, northbound 611 will depart on its return to Brattleboro.